Beginning in May 2018, the EU gave regulatory agencies greater powers to act against non-compliant organizations. A NYC area IT consultant and MSP discusses how businesses can comply with the new European data privacy law, the General Data Protection Regulation (GDPR), which went into effect May 25, 2018, in a new article on the eMazzanti Technologies website. The law applies to all organizations selling to or collecting personal data about customers in the European Union (EU). 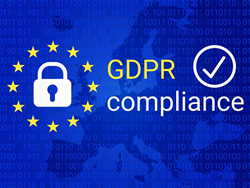 The informative article reviews the changes affecting businesses, the penalties of non-compliance and how technology providers can help organizations accelerate their response to the legislation and become GDPR compliant. The GDPR provides an opportunity to reevaluate and improve overall business cyber-security strategy and data management. For instance, with the findings of an audit, redundant, obsolete and trivial files will be eliminated. In addition, the transparency and responsibility demonstrated will help build more trusting relationships with customers and the public. GDPR compliance also allows an increase in marketing return on investment. Once an opt-in policy is implemented and a data subject’s consent to process their personal data is obtained, companies will be able to increase the effectiveness of their digital advertising. They can tailor messages to the specific needs and habits of a clearly defined audience that has more interest in the company’s brand. A business technology firm that is well-versed in GDPR regulations can prove to be an invaluable trusted partner in the compliance journey. The experts at eMazzanti Technologies help to broaden an understanding of GDPR compliance, identify issues that may not have been considered, help business leaders realize the myriad benefits of GDPR compliance, and direct or assist in their compliance effort. eMazzanti’s team of trained, certified IT experts rapidly deliver retail and payment technology, digital marketing services, cloud and mobile solutions, multi-site implementations, 24×7 outsourced network management, remote monitoring and support to increase productivity, data security and revenue growth for clients ranging from law firms to high-end global retailers. eMazzanti has made the Inc. 5000 list eight years running, is a 2015, 2013 and 2012 Microsoft Partner of the Year, 2016 NJ Business of the Year, 5X WatchGuard Partner of the Year and one of the TOP 200 U.S. Microsoft Partners! Contact: 1-866-362-9926, info@emazzanti.net or http://www.emazzanti.net Twitter: @emazzanti Facebook: Facebook.com/emazzantitechnologies.